If you were among the majority of Americans, you either expected or were pleasantly surprised to receive a tax refund in 2017, and a hefty one at that. According to IRS data, the average refund was $3,138, and, hey, what’s not to like about a big fat check in the mail? Having that kind of change in your pocket can go a long way in purchasing furniture, paying for a vacation, or just paying down some bills. However, have you ever thought about the opportunity cost of yearly tax refunds? Think of it this way, any money you receive back in the form of a refund each year was and is YOUR money. Uncle Sam might look like a nice enough guy, but he doesn’t just gift that money to you. He isn’t your rich uncle giving you a stipend or a portion of your inheritance. The money you receive by way of a tax return is YOURS because YOU overpaid. Would you ask a stranger to hold onto a few hundred dollars of your money each month with the hope they would get it back in about 12 or 15 months? Sure, while you have reason to trust that the government will give back your money each year, ask yourself this question: Rather than using the government as a placeholder of sorts for my money, what could I do with that $261 (and .50 cents, but who’s counting), each month that could further my financial stability? With the average credit card holder carrying roughly $5,300 in credit card debt, imagine how quickly you could wipe that slate clean adding $261 to your monthly payment. You may have great intentions to knock out that debt with a large lump sum from your anticipated tax return, but we all know that by the time April 15th rolls around that money is usually already spoken for. If you are clear of credit card debt, use it to knock out student loan debt, or your car loan. Using the money to pay down debt now not only can save you hundreds, if not thousands of dollars in interest payments, it also expedites the debt payment process and enhances your motivation to become debt free. Take advantage of our credit card debt payoff calculator which allows you to restructure your debt on an accelerated pay-off schedule. The bad, and good thing in this case, about taxes being automatically withheld from your paycheck is you get used to the money being gone before you even have the chance to miss it. This will make it easier to take the excess money you have been paying toward income tax and use it to make extra payments towards your mortgage. Adding a few hundred dollars to the principle of your home loan each month can go a long way at shaving years of mortgage payments with its accruing interest. You can see the impact of adding those extra dollars to your payment with this debt pay down calculator. If you are coming from behind when it comes to retirement savings, or even if you have a well-funded nest egg, investing $261 a month is a great way to begin or boost your savings. Why let the government have your money free of charge when it could be working for you in your company’s employee savings plan or a Roth IRA? Leaving the money alone and letting it grow through the benefit of compound interest, will pay off more in the long run than a new couch for your living room, or another trip to the beach. While there is a lot to love about your name being on a big check from the government, especially after the hassle and headache of tax season, think about how a small change to your withholdings can make a big difference in your financial future. If you are one of the millions of Americans projected to receive a large refund next spring, consider adjusting your W-4. You’ve worked hard for your money – its time you decide when and where to use it. If you are just beginning to invest and want to know how much money is needed to retire at 65, our retirement age calculator is a good place to find that information. 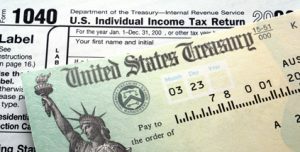 Do you anticipate a large tax refund? How could you use a few hundred dollars of extra money each month?